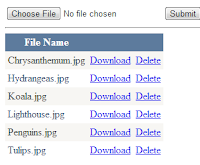 ASP.NET Asp.Net 4.5 C#.Net FileUpload Control GridView Examples VB.Net How to upload, download and delete files from GridView in Asp.net? 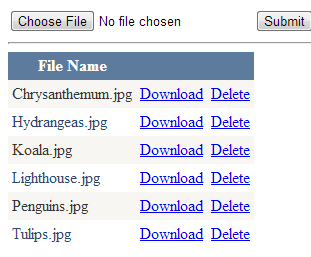 How to upload, download and delete files from GridView in Asp.net? In this article I have explained the way of uploading the image/file in the folder and displaying the file in Gridview from that directory, download the file from GridView and also how to delete the image/ files displayed in the GridView control using asp.net in both the C# and Vb languages. EmptyDataText = "No files uploaded" CellPadding="4"
this code is very helpful. Thanks neha for your valuable comments..